Predict the mean value of the response variable for new combinations of settings of the predictors. Draw factorial plots, surface plots, contour plots, and overlaid contour plots. 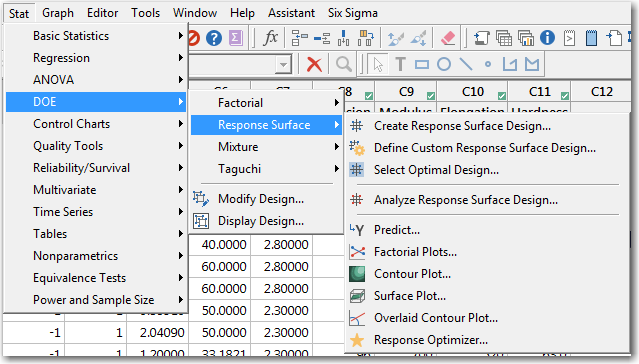 Use the model to find combinations of predictor settings that optimize the predicted mean of the response variable. Choose Stat > Regression > Regression > Fit Regression Model. 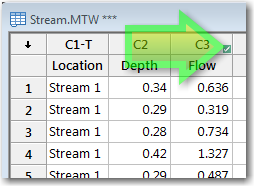 In Continuous Predictors, enter Depth. In Categorical Predictors, enter Location. Click OK.
Once you’ve clicked OK, the green checkbox will appear in your worksheet to show that you have a valid model. Choose Data > Conditional Formatting > Statistical > Unusual X. In Response, enter Flow. Click OK. 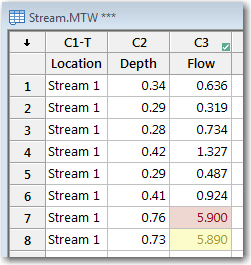 The text and background color for the response value in row 7 changes so that you can see that it’s unusual to have a depth of 0.76 in the first stream. You can indicate values that aren’t fit well by the model in a similar fashion. 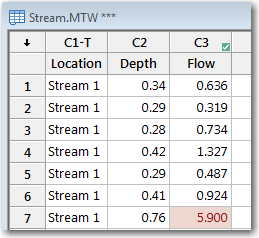 Choose Data > Conditional Formatting > Statistical > Large Residual. In Style, select Yellow. Click OK.